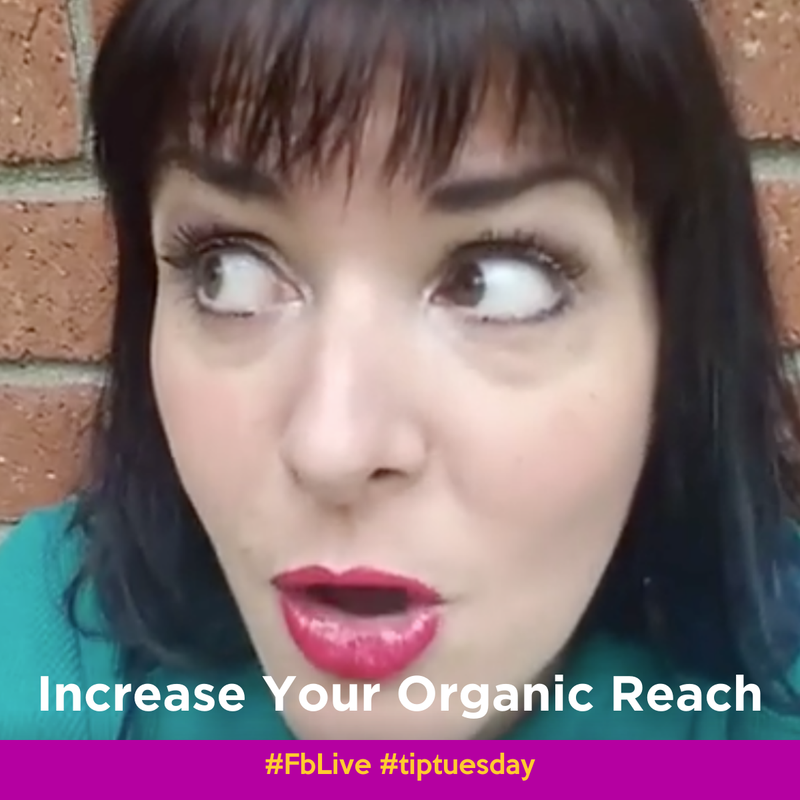 Increase the organic reach of your posts! Easy way to increase the organic reach of your posts! Helloooooo! So nice having you on with us! Yep. I’ve done that and it makes a huge diff in response!!! YOU GET A MASTER CLASS! YOU GET A MASTER CLASS! That is work we want!! Follow up with potential clients!!! Did you do yesterday’s give away? The internet gremlins got me.. I love that you are encouraging relationships! thanks for the secret sauce to FB live! Comment below! Repurposing! Let me in! Yes! yay! http://www.LiveVideoMasterclass.com It will be super fun! <3 love it and your energy! I used it once you are so right. My best video ever! It was for a giveaway! Was so awesome and reached a ton of people! C-O-N-N-E-C-T-I-O-N is where it’s at! Molly I appreciate you so much! I appreciate you too, Lady! Do you message the people commenting directly? Sometimes, but usually I come in and comment back like this, it’s a little quicker and it helps boost the organic reach “juice” of the video. Even tho you were watching the replay, did it feel like you were actually a part of the convo? It’s my favorite thing about fb live. But when you comment can’t later viewers just see that link and have no need to comment? Yes – so I usually add it up above as well.. BUUUUUT see how you are commenting? And I’m responding. So, we are having a mini convo! : ) And, when that happens, not only do we connect a bit, fb also gives the video more organic reach. Ummmmm… and – how did I not know about your podcast! Ha! Love it! You got it! Yay! Join us by clicking… http://www.ElevateYourAwesome.live ! Would love to join the group ~ thanks! I think I just registered for your master class as well! I would love to be apart of your free support group! I’ve already registered for your masterclass and am so excited ? Hi Molly!!! I would love to be included!! I love your energy!! You got it! http://www.LiveVideoMasterclass.com Yay! Here’s the link : ) http://www.ElevateYourAwesome.live. Request to join and I’ll add you! You got it! http://www.LiveVideoMasterclass.com See you there! OMG! How fun! That’s on my bucket list for sure. So cool! What do you offer in your biz? Yay! Here’s the link for the fb group http://www.ElevateYourAwesome.com See you there! Tiffany Calderon -Molly is awesome! Hi Sharon! Here’s the link for the master class… http://www.LiveVideoMasterClass.com Yay! Let me in! Masterclass too, thank you! Yay! Here’s the link for the fb group… http://www.ElevateYourAwesome.live and the masterclass http://www.LiveVideoMasterClass.com Sweet! Hi!!! Here’s a link to get the master class replay : ) http://www.LiveVideoMasterclass.com Yay! I shared in my group! Hi Sharon! Here’s the link for the masterclass jic : ) http://www.LiveVideoMasterclass.com see you soon! Master class please and thank you! Hi Sara! See you soon in the Masterclass – here’s the link http://www.LiveVideoMasterclass.com Yahoo! Let me in! Master class!! I would love to be in the group!! http://www.LiveVideoMasterclass.com Here is the link! next class is on May 31st! Let me in! Masterclass! Thanks! I should just go grab that domain – and forward it! Molly Mahoney – The Prepared Performer it was in your group my friend! Tracy Capps Selle, you’ll love this tip! Group in please Molly Mahoney – The Prepared Performer! I would like to join your free group? Please add me. Let me in, please! Master class! Yay! You got it! http://www.LiveVideoMasterclass.com Come play with us! Master class let me in Molly! Love your makeup. So pretty. master class and I want in! I would love to join! And master class! Let me in! Master class! Let me in. And interested in to the free live season. Can I get in too please? Master class! And Elevate your Awesome! Hi hi …let me in please n thank you ! Lisa Thompson Realtor let me in! Let me in and Masterclass Molly! http://www.elevateyourawesome.live This is the link to the live support group!! http://www.elevateyourawesome.live If you haven’t been added to the group yet, go here! Let me in!! Master Class! Yaya! Master class Molly!! Also let me in the group pls!! Molly Mahoney – The Prepared Performer thank you! Let me in! Masterclass Molly! Let me in and Master Class Molly! Sounds like a great group can I get in? Let me in. Masterclass please. Let me in Master class please!!! Molly Mahoney – The Prepared Performer thank you!!! Let me in! Master Class Please Molly!! Let me in please! Master class Molly! Let me in! Masterclass please! Let me in! Master Class Molly 🙂 thank you! Let me in! & Master class, Molly! Thank you Molly, Let me In! Hi! I pre-paid for this class & realized I missed the date. Is there a link or video I can watch? Let me in please and master class! You did this video in January and I’m just seeing it on my newsfeed today. Yes, it worked! Let me in, master class please. Master class! Let Me in. Let me in! And Masterclass! Replay! from Billy Funk’s shout out about YOU!!! Let Me In! please and thank you! !